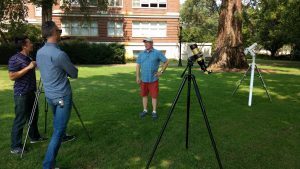 OSU’s August 19-21 eclipse event, OSU150 Space Grant Festival: A Total Eclipse Experience, was featured on KMTR on August 19th. Department of Physics graduate student Dr. Atul Chhotray was interviewed for the story. You can see the full piece here. The OSU Astronomy Club was very active in the educational outreach stations at this event. Thank you to our volunteers for your time and enthusiasm in making last weekend a fun, educational experience. Posted in Eclipse, Faculty, Outreach, Teaching and Learning. 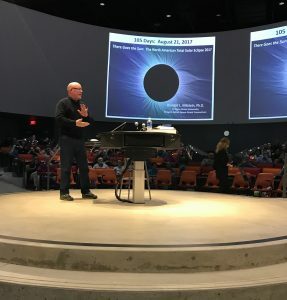 Oregon NASA Space Grant Consortium Astronomer- in-Residence and Oregon State University Physics and Honors College Instructor Randy Milstein has had a busy month speaking about the 2017 Great American Eclipse. The links below highlight some of his presentations and interviews. Follow this link to his interview with Al Jazeera English (The first independent news channel in the Arab world dedicated to providing comprehensive news and live debate). He spoke with the OSU Alumni Association in Beaverton, Oregon on August 8. A link to his presentation is here. On August 14, he was interviewed by OSU’s KBVR radio station. He was interviewed for the CBS This Morning story, “Man Bikes Across the US to Educate America About the Solar Eclipse,” that aired on August 19. He isn’t the man on the bike. There wasn’t enough time with all of his other outreach events! The feature is available here. His portion of the story is at minute 3:16-3:34. Posted in Eclipse, Faculty, Outreach, Uncategorized. 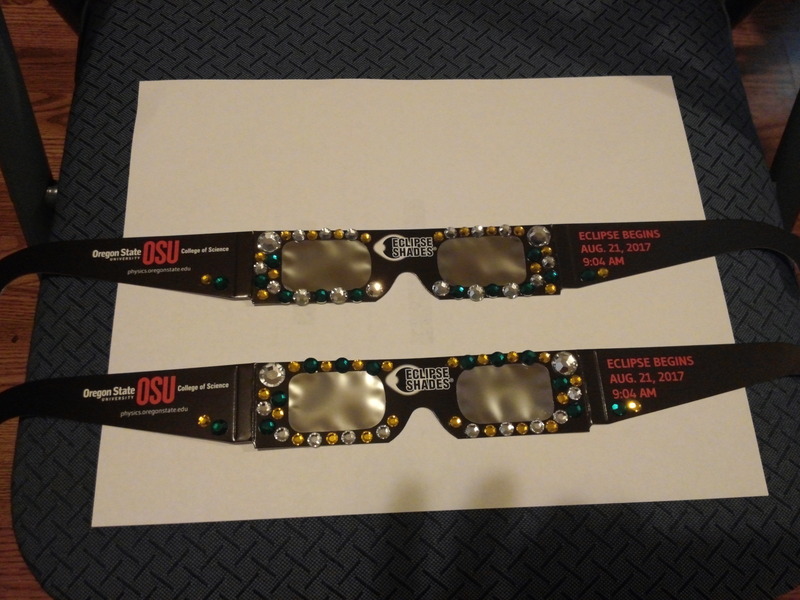 Kelly Carter, our creative Physics Office Manager, added some extra style to a pair of eclipse glasses. 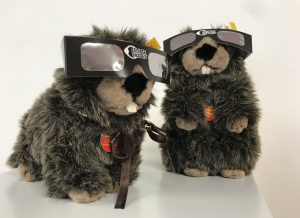 The Physics Beavers are ready for the eclipse. Are you? Follow this link for travel and viewing safety tips. Randy Milstein spoke at the Eugene Register Guard on June 6. The article from the newspaper, as well as a five minute video on how to safely view the eclipse, is available here. Posted in Eclipse, Faculty, Outreach. 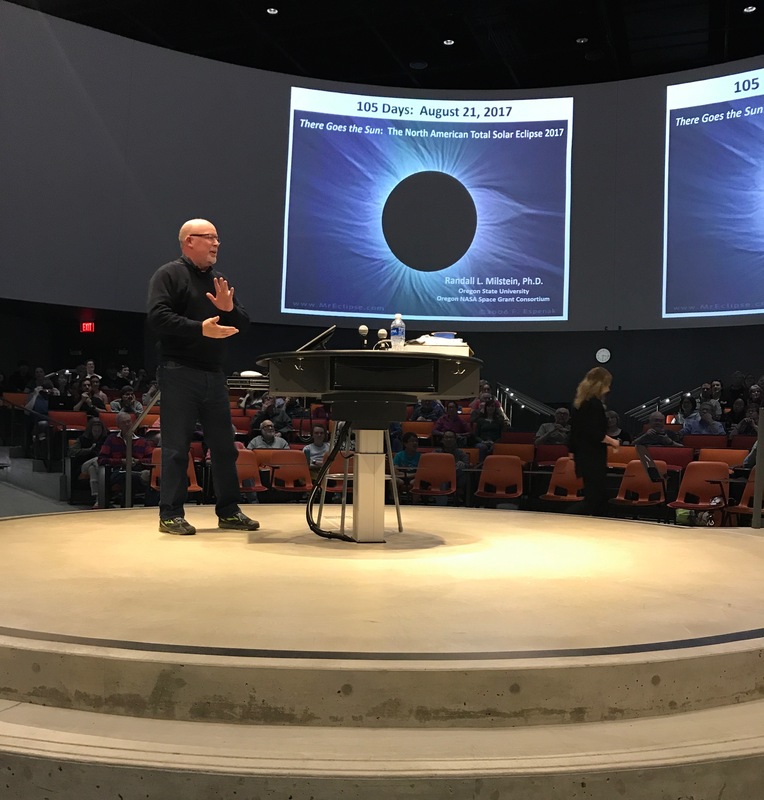 Dr. Randall Milstein gives an OMSI Science Pub talk on the upcoming eclipse. Physics graduate student Tyler Parsotan explains the science of a Solar Eclipse in this How-To video. Tyler is President of the Oregon State Astronomy Club and is working with schools and libraries on information about the Eclipse on August 21, 2017. Tyler’s explanation is about 2:00 in the video. Posted in Eclipse, Graduate Students, Outreach, Students.